As expected the weekend at the Mahalia Jackson Theater for the Performing Arts turned out to be a bonanza for music fans of the Louisiana Philharmonic Orchestra (LPO). It is true that the crowd that experienced a breathtaking evening of choral work from Johannes Brahms (Shicksalied or “Song of Destiny”) and a magnificent reading of Gustav Mahler’s Symphony No. 9 on Saturday night was vastly different than the rockers that gathered for the Led Zeppelin tribute show on Sunday night. 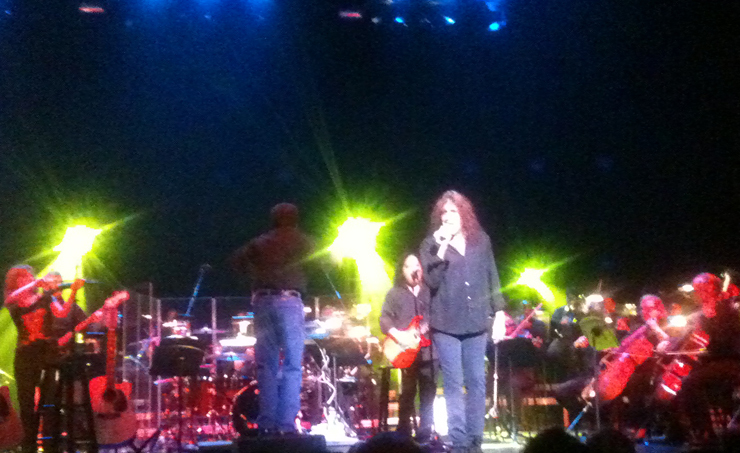 Zebra frontman Randy Jackson, a New Orleans native, leads the LPO in tribute to Led Zeppelin. The fact the nation’s only musician-run orchestra is able to move so easily from highbrow to longhair music is a testament to their musical sensibilities and their understanding of marketing. The Saturday night concert conducted with authority and brilliance by artistic director and maestro Carlos Miguel Prieto was about the LPO’s love of classical music and its commitment to continue to provide opportunities for its musicians to interpret the great works of that genre. Yet the sell-out show titled “The Music of Led Zeppelin” that starred New Orleans-based singer Randy Jackson of the nationally prominent band Zebra attracted a crowd of rowdy, but fun-loving rockers. Never were two crowds on successive nights more different, nor more adamant in their love and support of the LPO. The LPO reaped in that love and support and much more. It didn’t matter to the LPO that its more artistic endeavor on Saturday night was less attended than the Sunday night spectacular with its huge speakers and blinding lighting designs. The profits from the Led Zeppelin show will help to continue to fund its work and earlier public performances this month at City Park, Lafreniere Park and Champions Square at the Mercedes-Benz Superdome have brought the masses to the LPO and left behind warm memories for the community at large. It is probably true that very few of these self-employed musicians could have imagined themselves playing backup to rock music 20 years ago when the idea of the LPO was first bandied about. They were reborn like the veritable phoenix out of the ashes of the financially riddled New Orleans Symphony Orchestra and today’s LPO is much stronger and more dedicated towards ensuring its longevity for generations to come.